MISSION : The Denver Scholarship Foundation inspires and empowers Denver Public Schools’ students to enroll in and graduate from post-secondary institutions of higher education, by providing the tools, knowledge, and financial resources essential for success. 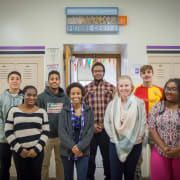 PURPOSE OF JOB : To support the mission of the Denver Scholarship Foundation by supporting the DSF College Advisor at the assigned high school’s Future Center. Volunteers are vital to the organization in order to maintain a high level of service to students. Volunteers support College Advisors through performing a multitude of tasks and working directly with students. COMMITMENT REQUIRED : A minimum commitment of two hours per visit is requested, and a weekly or biweekly commitment is preferred throughout the school year. We ask volunteers to commit to 6 months of volunteerism, as students develop rapport with volunteers. Volunteer opportunities are available Monday - Friday, roughly 8:00 a.m. - 3:30 p.m. during the school year (August-May). Schedule will be determined by you and your supervisor. Experience working with any of the following: limited income students; first generation students; students of color; students from varied communities and backgrounds. ORIENTATION AND TRAINING PROVIDED : Volunteer orientations are required as an overview and first step for DSF Volunteers. College Advisors will provide training for specific tasks pertinent to the operations of the Future Center. A background check is required to fulfill this role. This is not a mentorship position. LOCATION OF JOB : Various High Schools in Denver, Colorado. All volunteers are required to move through volunteer on-boarding process which includes an application, phone screening, background check, and orientation.